If you can believe it, Civilization V launched nearly six years ago. That’s enough to make anyone feel old. 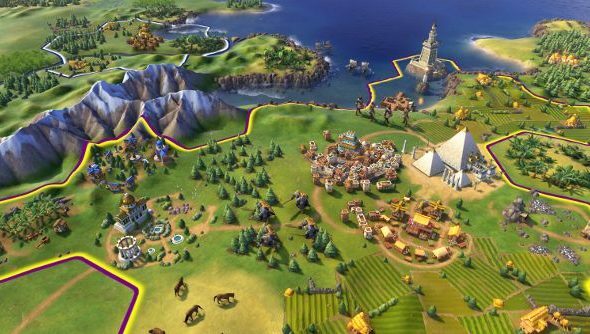 Since then the game has received innumerable fixes, tweaks, additions and expansions, but nothing to match the scale of change that’s due to arrive in the form of Civilization VI. Enjoy waging war on a continental scale? You’ll love our list of the best strategy games on PC. So, with Civilization VI officially announced and plenty of gameplay changes to discuss, we had a chat with lead designer Ed Beach and gameplay designer Anton Stringer to find out a little more about city districts, combined arms units, tech tree changes and of course… warlord Gandhi. PCGN: When you’ve got a series like Civilization how do you go about choosing what features to keep from previous games, what to evolve, or even do away with entirely? Ed Beach: It’s a really good question and it is exactly the first thing we wrestle with when we start working on another iteration in the series like this. One of the key things to keep in mind is that a lot of the team working on Civ VI, the vast majority of us worked on Civ V, especially the two expansions, Gods and Kings and Brave New World. Anton and I were both two of the lead designers on those products, so it was even tougher this time because there was a lot of stuff with Civ V that was near and dear to our hearts: we had just finished putting in this new culture victory system with archaeology, great works and all that stuff so, we didn’t want to strip out a lot of that stuff. 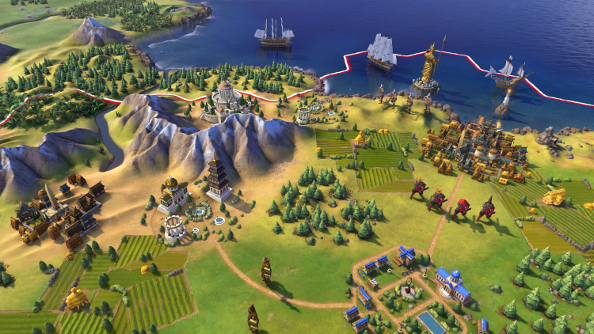 We wanted to keep quite a bit of it around so we made the decision early on that there wasn’t going to be a large stripping out of any of the subsystems – pretty much everything you had with Brave New World is coming back for Civ VI. What was challenging about that was we knew that the technology we had been building Civ V on was getting outdated – there was still a lot of Civ IV code in there, we definitely needed to do a technology refresh. We wanted to make sure that we set everything up to be really well suited to modding going forward, and in order to do that we really needed to re-write all of the gameplay code from scratch. One of the most dramatic changes to Civ V was the one unit per tile rule. You’re keeping it in Civ VI but with a twist – how are the combined arms units going to work? EB: The tactical complexities you had on the battlefield once all units were spread out, and the rock, paper, scissor games you had by trying to get your cavalry around to the rear and attack your enemy’s archers who might be vulnerable to that – we wanted to keep that kind of interplay. But we knew that Civ V did suffer from cases where the map and the battlefields would just be too congested with units, so we wanted to take another pass and refine it so we could stack units but not destroy that tactical complexity. All the units that really weren’t military commands on their own – things like battering rams, siege towers, anti-tank and anti-aircraft guns – in Civ V they had to have a tile to themselves. What we came up with is those units going into a new class of units, and get their own layer of stacking. You can’t have two support units in the same tile but they can be combined with military units or civilian units or trade units or whatever and not interfere with the stacking. Later in the game when you have a lot of production and you can get a lot of units into play, we’re also going to give people the ability to combine units of exactly the same type into a corps or an army and those really potent large forces would just occupy a single tile and provide more punch to get through an enemy line. With those combined arms units are you trying to win over players who maybe missed being able to create stacks of doom in previous Civ games? EB: I think at this point the Civ IV die-hards – most of them, at least – have made their peace with Civ V, so I don’t think that’s a key goal for us at this point. But, if you look at Civ III it had the ability to combine units together, if you had a great general you could stack three units together and that would be an army – so it sort of goes back to those days. How are cities are going to work now? What’s the extent of the city customization? EB: Think about this as unstacking the cities. If you look at any of the previous Civ titles and what was inside the cities, you just had dozens and dozens of buildings all stacked in that same city – in your main city you might have eight, ten, 12 wonders. It drove our art department to distraction trying to represent that in a single tile; it was a worse stacking violation than what we were doing with the armies in Civ IV. It was really time to blow this apart and get them spread across the landscape. That’s what we’ve done with Civ VI, and it’s just unlocked all sorts of interesting gameplay options. We have 12 different types of districts and you’re not allowed to instantly boom, you have to grow a city and it’s only allowed a certain number of districts based on what its population is. Right away you’ve got a small city, it may only be able to support two districts at this point in time and you have to choose which two out of those 12 are going to be right for that city, so you’re specialising your cities right out of the gate. How about terrain, how does that interact with the landscape? EB: Terrain and the map are really going to be driving your play. That’s one of our big messages in terms of how we’re going about designing Civ VI, we wanted to break up players who found a regular pattern for how to play their games optimally: which social policy trees to go through, how to approach the tech tree. All of those players got very regimented. Anton Stringer: If I started a game of Civ V and found I was starting by a bunch of mountains I’d be like, ‘maybe it’s a nice natural barrier against invasion but it’s not very exciting.’, When I start Civ VI I’m excited to see mountain ranges because I see all the district possibilities there. EB: In general we try and come up with bonuses that make sense and have a real world tie, so the reason the science campus gets a bonus from mountains is because we feel like scientist want to observe the skies, they want to understand our place in the universe. The other thing scientists like to do is understand the biology of different creatures and species, flora and fauna – the best tiles for that are the rainforest tiles and that’s the other thing that science districts get bonuses from beside mountains. So say I’ve got this big advanced city with multiple districts and I’ve upset Montezuma and he attacks me… if he lays siege to my city is he doing it as one object or as different elements? EB: As a little bit of both. It’s still control of the city centre that determines who owns the city and it’s still control of that that’s going to flip all the tiles of the city to being aztec, however there’s a lot of nuance. All those districts you put outside the city are vulnerable to enemy attack independently of whether or not the city centre has been taken. So, if Montezuma has a whole bunch of fast moving cavalry in his army and he knows he’s not going to be able to punch through a heavily defended city centre with walls, what he can do is bring those cavalry in and pillage my districts and my science and industrial capacity. There’s a lot of damage you can do to your enemies without actually taking the city. It gets really crazy late in the game when you have air forces, because now we have strategic bombing. It’s not to conquer cities but very much along the lines of what you saw during World War II, like Allied strategic bombing campaigns on Germany to target the Ruhr Valley where all the German industries were. That kind of stuff can happen now. Research is more active now – how can players unlock boosts and what will those boosts actually do? AS: It bothered us that you could have a tech tree path that you take every time, one of the infamous ones in Civ V was rushing to get the Great Library because it was really powerful, so we wanted to shake up that game a little bit. When I look at the tech tree in previous Civ games now compared to Civ VI it seems like there are scientists up in an ivory tower just researching away at sailing even though they’ve never discovered the ocean before. What we’re doing with the boosts is they’re kind of like mini-quests or objectives that are on the map. If you settle a city on the coast you will unlock a tech boost for sailing, so each technology has its own condition and it’s got some great historical flavour to it. Specifically in terms of gameplay it gives you half of the research progress towards that technology so it’s really significant – sailing would normally take 16 turns, but it’s down to eight if you unlock this boost. How do diplomacy and leaders work? Does diplomacy evolve as civilzations become more advanced? EB: In Civ V most of the leaders sort of felt the same. AS: And there were general rules of thumb regarding what they’re not going to like – they’re not going to like you if you do this, they will like you if you do that. They’re generally going to want to win and have large empires; their goals were similar a lot of the time. EB: And so now we’ve shaken it up and we’re giving leaders a sort of side agenda that is their own thing they care deeply about. We’ve tried to tie those to things with their empire when they were ruling it historically, so we’re calling it historical agendas. We might have a leader who feels he is better at building wonders than anyone else in history, and he wants to make sure that he shows that to you, so he’s obsessed with building wonders and if you compete with him as the greatest wonder builder ever he’s going to be angry about that. Once you know these historical characteristics of leaders the diplomatic landscape gets very interesting as you can play these traits off against each other so you might be able to set two leaders up so that they end up butting heads and giving you some breathing space. I imagine you’ll still surprise us with Gandhi throwing nukes at people? 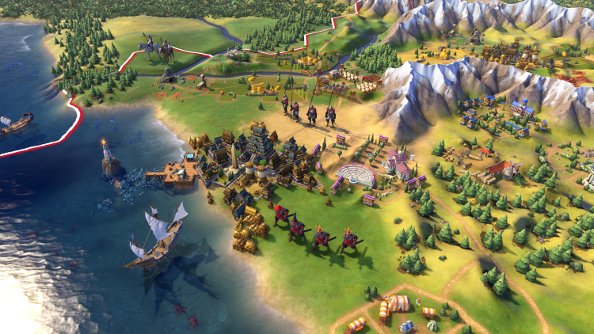 Civilization VI is due for release on October 21, 2016.